Victoria Blewer grew up in Manhattan, but bolted for the quiet hills of Vermont. 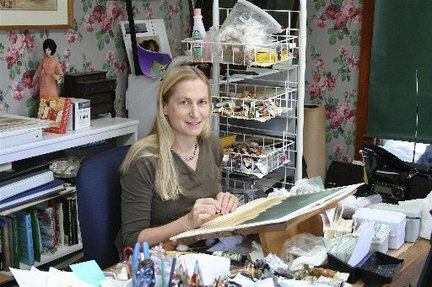 She works entirely with black and white films (sometimes using black and white infrared film), and then she hand-colors the images. Her hand-tinted photographs have been featured in full-length photo essays in the Boston Globe Sunday Magazine, Vermont Life, Vermont Magazine and Yankee Magazine. Her work may be seen at Woodstock Gallery in Woodstock, VT; the Vermont State Craft Center in Burlington, VT; the Edgewater Gallery in Middlebury, VT; and the Harmon Gallery in Wellfleet, MA. Ms. Blewer has won many national and regional awards for photography, including: First Place for Photography, Washington Square Art Show, New York, NY; Distinguished Artist Award for Two Dimensional Art, The Stratton Arts Festival, Stratton Mountain, VT; Most Promising Young Artist from the Virginia Beach Arts Center, Virginia Beach, VA; Award Winner for Women in the Visual Arts at the Erector Square Gallery, New Haven, CT; Best in Show for all media from the Chaffee Art Gallery, Rutland, VT; Honorable Mention at the T. W. Wood Gallery in Montpelier, VT; and Honorable Mention at the Salmagundi Club in New York City. Her photographs have appeared in numerous newspapers, magazines and books, and have been displayed in private homes and offices across New York and New England. Her work has been exhibited at The Fitchburg Art Museum, Fitchburg, MA; Dartmouth College's Hood Museum of Art, Hanover, NH; the Erector Square Gallery, New Haven, CT; W Photography, Provincetown, MA; the Alternative Museum, New York, NY; the Fuller Museum of Art, Brockton, MA; the Attleboro Museum of Art, Attleboro, MA; the Berkshire Museum, Pittsfield, MA; the Westport Arts Center, Westport, CT; the Salmagundi Club in New York City; the Woodstock Gallery of Art, Woodstock, VT; the Stratton Arts Festival, Stratton Mountain, VT; the Vermont State Craft Centers in Burlington, Middlebury and Manchester, VT; Shelburne Farms, Shelburne, VT; and the Hooloomooloo Gallery, Boston, MA. Ms. Blewer was born in New York City, is a graduate of Smith College in Northampton, Massachusetts. She refined her art with classes at the New School in New York City, the International Center of Photography (ICP), the Visual Studies Workshop in Rochester, NY and the University of Vermont. She lives in Middlebury, VT.